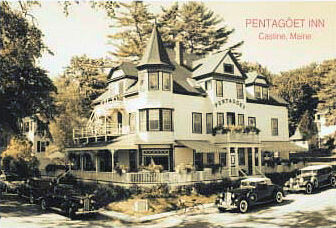 The Pentagoet Inn is located in the heart of Castine's historic waterfront district. Nestled on a seaside bluff graced with majestic elms, it overlooks the quaint village and gracious harbor. The Inn, one of Maine's few remaining original "summer hotels", was built in 1894 when Castine was a bustling seaport and guests arrived by steamship. This whimsical Queen Anne Victorian with it's three story turret, quirky gables and adjoining 18th. century cottage, has 16 bedrooms, all with private baths. The rooms are furnished with attention to detail, antiques, vintage lithographs, down pillows and old fashiomed floral coverlets. The Pentagoet has a well reviewed restaurant serving exceptional homecooking featuring lobster and local shellfish, native fish and game, New England specialities and fine desserts. There is a well stocked wine cellar and a full bar, reservations are recommended. Come stay in our vintage "summer hotel" and visit the old, authentic, Downeast Maine. This and other MaineBed and Breakfast Inns can be found here online in The Register. A warm comfortable bed and a tasty breakfast can make for a holida or business travel day!